Research Papers, News Articles, Press Releases etc. One element of the Sensefolio score is the information retrieved from the financial news. Sensefolio covers multiple financial news websites – this includes Bloomberg News, CNBC, Reuters, Seeking Alpha, TheStreet, NASDAQ, MarketWatch, as well as the Financial Times. Integrating multiple news vendors allows Sensefolio to not only have a more accurate way of evaluating news, but also to aggregate the news from different vendors in order to compare them. This latter helps cope with “fake” news and gives Sensefolio a better representation of what is really and actually happening. Sensefolio’s algorithm thus requires at least two main news providers to deliver the same information in order to integrate it. Sensefolio updates its scores as soon as it receives new information from our list of news providers. In this way, Sensefolio provides a near real-time update to be on top of new information, which is a key component in the financial industry. Relatively small news providers are to be compared with other news providers in order for Sensefolio to check the veracity of the information. Sensefolio is doing its best to prevent ‘fake’ news to be integrated into its systems by aggregating different sources of information and considering one information to be untrue as long as another source of information does not disclose it. Below are a few examples of ESG-related news; BlackRock and Wells Fargo betting on Ethical Investing Funds for 401(k)s from Bloomberg News (see exhibit 1), Asset Managers engaging in ESG ‘war for talent’ from the Financial Times (see exhibit 2), and UBS Asset Management’s Harford saying she’s changed her mind on ESG investments from CNBC (see exhibit 3). Sensefolio’s algorithm is set to screen and update its database on a (very) regular basis (i.e. every hour). Although Sensefolio’s scores are to be integrated into medium to long-term portfolios, we endeavor revising them frequently in order to have an accurate ranking at any point in time. 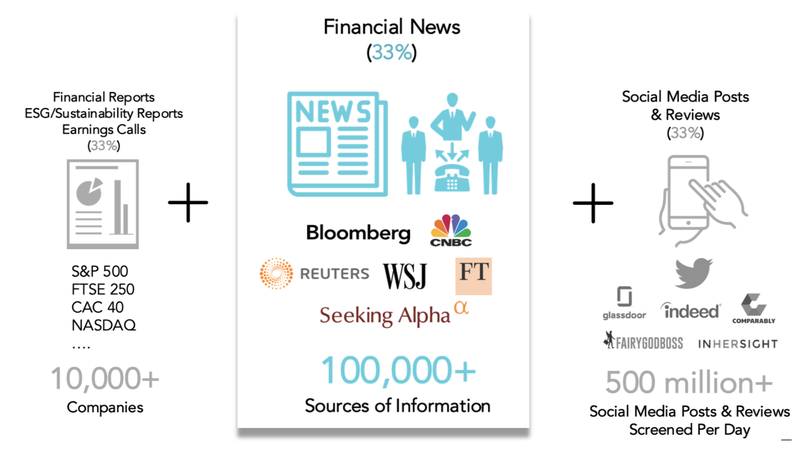 Analysing and reading financial news is not the only one input into the Sensefolio scores, the algorithm also screens companies’ financial reports and social media (see subparts below).